Orion Nebula, easily visible at night in the northern hemisphere in the west, in the background is surrounded by gas and dust generated by the stars that form. This powder, eye or with a photograph of the visible spectrum does not appear and if under X-rays. 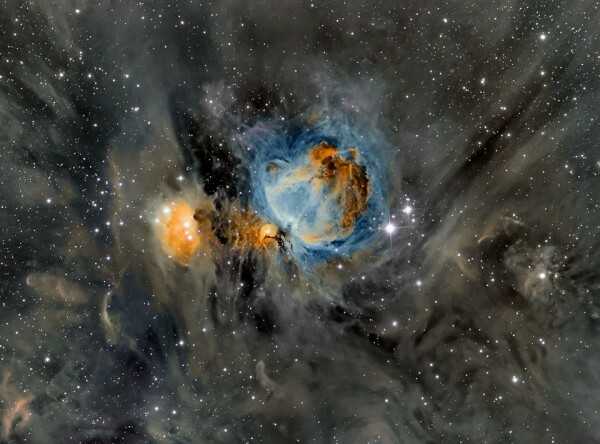 All this dust with the M42 (the Orion Nebula) is called “the field of Orion”. The gas and dust have different densities corresponding to the different colors. While there is little gray, blue or bright it is filled to the legs. In a few million years, all this anger disappearing powder and form new stars. Meanwhile, dust, remember, is composed of material ejections own stars that form and blue giants. The blue giant stars are very large, unfortunately for them, have little gravity in the outer layers and the core is far removed from such layers making easily peel off by external agents (gravity of other stars, dust itself …). Come on, its outer layers are like shreds of cloth.